Process control with oxy probe / dew point. Ideally suit for batch operation for automotive/ auto component, bearings/fasteners etc. Data acquisition – optional scada based. 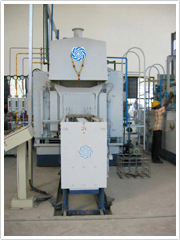 Process – case hardening ( carburising / carbo nitriding), throu hardening, annealing / normalising. Carrier gas – endothermic + LPG/ nitrogen+methanol. Twin chamber – semi continuous furnace. Available capacities – gross loading – 400, 600,800 and 1000 kg per batch.